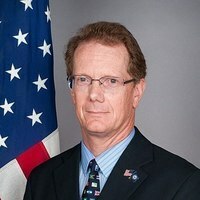 James Nealon served as United States Ambassador to Honduras from 2014 to 2017. After his service as ambassador, Nealon was appointed assistant secretary for international engagement at the Department of Homeland Security in July of 2017. He resigned his post in February 2018. Before assuming his post as Ambassador to Honduras Nealon served as the Civilian Deputy to the Commander of U.S. Southern Command from September 2013 to August 2014, and was Deputy Chief of Mission of the U.S. Embassy in Ottawa, Canada from 2010 to 2013; Deputy Chief of Mission in Lima Peru from 2007 to 2010; and Charge d’Affaires and Deputy Chief of Mission in Montevideo, Uruguay from 2005 to 2007. Previous foreign service assignments include posts in Spain, Hungary, Manila and Chile. Nealon has been awarded the State Department’s Superior Honor Award as well as numerous senior performance awards. Co-Sponsored by the Latin American, Latino, & Caribbean Studies Program, The John Sloan Dickey Center for International Understanding, and The Nelson A. Rockefeller Center for Public Policy and the Social Sciences.